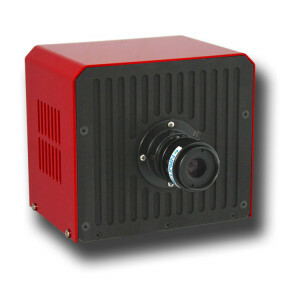 The MIRA™ is a compact and economical mid-IR camera system that brings affordable infrared imaging to researchers, OEMs, and commercial applications. A thermo-electrically cooled 64×64 pixel, large format PbS focal plane array provides excellent image performance across a wide spectrum from visible to 3.2um. A C-mount optics adapter accepts industry standard lenses to match the camera optics to the imaging requirements of the application. With a color graphic touch screen video display, the MIRA is fully functional as a stand-alone camera without the need for an external display system. A high speed USB 2.0 bus is also provided for remote video display and image acquisition. The MIRA™ comes with a standard library of image analysis functions. Additional application-specific libraries are available to extend the functionality of the MIRA™. OEM inquiries welcome. © 2019 Dyn-Optics. All Rights Reserved.